Bond Economics: How Can The Household Sector Cause Recessions? How Can The Household Sector Cause Recessions? This article offers an overview of the mechanisms by which the household sector alone could cause a recession. If we put aside the possibility of disruptions to the financial market (since that is external to the household sector), the main mechanism is probably via the housing market. If we look beyond housing, we can see the differences between the neoclassical ("mainstream") and post-Keynesian approaches. The neoclassicals emphasise the effects of interest rates on consumption, whereas the post-Keynesians are largely forced to look elsewhere for explanations for recessions. What follows is an unedited first draft from my manuscript on recessions. The manuscript is already 20,000 words, and this is not including many articles that were published on my website and not yet incorporated. Since I normally targeted about 30-35 thousand words for my books, this is a sign that the manuscript is well under way. The difficulty with this article is that the most interesting bits end up being discussed in other sections of the book. It is a section in a chapter with the title "Post-Keynesian Real Business Cycle Models," which discusses models in which there are no financial market disruptions. (Yes, it was no accident that this title was chosen.) It refers to the following texts, none of which are available (yet) on my website. A chapter on post-Keynesian models in which financial market disruptions affect activity. A chapter on neoclassical models and recessions. Since many readers will already have opinions on those subjects, they can fill in the blanks on the missing topics. Rather than work around these omissions -- since they are important -- I will leave the handing references. I realise that this is not exactly polished, but at the same time, the fact that I use this website to publish unedited drafts to solicit feedback explains why I can publish the articles for free. Thus far, the focus has been on the tendency for the business sector to generate a cycle in growth. Household behaviour was assumed to be stable, to allow us to examine the feedback loops created by investment. We now examine the effects of changing household behaviour. To a certain extent, changes in household behaviour has been a major driver of the post-1990 business cycle in the developed countries. In particular, the housing market has become a dominant economic force (which will be discussed at greater length in the section on housing). The first point to note is that we need to look beyond one obvious point: a drop in household consumption will typically represent a large percentage of the reduction of GDP during a recession. Household consumption is a large percentage of total expenditures in the economy, and it would be quite difficult for GDP to contract when household consumption is rising. We are assuming one stylised fact: that consumption is a large percentage of income for households. If we use a stronger definition of recession than just a decline in GDP (for example, the NBER definition), a recession implies an increase in unemployment. It is not particularly surprising that people that lose their job spend less. Instead, we need to look at three types of behavioural shifts that could be linked to the start of a recession (not in order of importance). 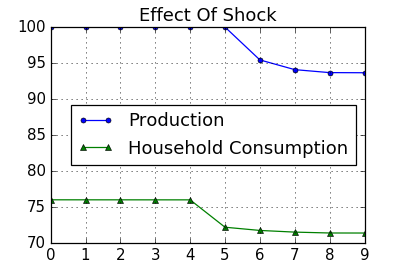 Households could change consumption patterns in a way that lowers domestic output. Investment tied to households could increase. Households could reduce spending relative to incomes (or wealth): the propensity to consume. The first possibility – a change in consumption patterns – is somewhat difficult to model at the macro level. The only plausible example I can give is a repeat of the oil shock, where the price of energy soars. If the energy is imported, spending will be diverted to imports, which is drag on GDP and profits. In addition, even if the energy is produced domestically, the energy sector will not be able to increase employment rapidly enough to offset losses in other sectors. However, in the case of an energy shock, all sectors would be hit, and so it is not really something we can pin on the household sector in particular. The second possibility – changes in investment associated with the household sector – is important, but somewhat of a misnomer. Depending on the definitions used in the national accounts, very little investment may be associated with the household sector currently. This would not always have to be the case. For example, one could imagine the rise of consulting-style businesses that results in “business” investment activity being measured as part of household expenditures. (The driver of this switch could be technology or tax arbitrage). However, I would argue that that this theoretical possibility is really a measurement issue: from a theoretical perspective, the behaviour should be lumped in with the modelled business sector. The main investment associated with the household sector is residential investment, and if we want to be loose with our definitions, the housing market more generally. Although the purchase of an existing house does not qualify as “investment:” in the national accounts sense (as it is just a transfer of an existing asset), it is an “investment” in the other sense of the word: a portfolio allocation transaction. Residential investment may be classified under business sector investment, but it is really tied to household sector activity, so it should really be analysed separately. The housing market is a critical market for business cycles, and its discussion will be deferred to the section on residential investment. The remainder of this section puts housing market issues to the side. The only remaining “investment” that might be associated with the household sector would be the purchase of durable goods. From a national accounts perspective, these expenditures are typically classified as current consumption. However, we might want to break out important categories, most notably vehicles. The automobile industry is cyclical, and perhaps worth breaking out as a sub-sector. From a modelling perspective, the interesting part of durable goods expenditures is that they should be more interest rate sensitive than other expenditures. Auto loans and leases are far more common than loans for iced coffee drinks. This should show up in models that analyse the effects of interest rates on household consumption (as will be discussed in the chapter on neoclassical models). We are left with the possibility of a change in the propensity to consume. Broadly, neoclassical models are more likely to associated business cycle fluctuations to changes in the propensity to consume. The post-Keynesian bias is to treat consumption patterns as being more stable, but with a much greater emphasis on the effects of the effects of the distribution of income. The argument is that lower income households (workers) have a greater propensity to consume out of current income than high income households (capitalists), and so a change in the distribution of income will change the aggregate propensity to consume. The neoclassical literature does its best to avoid questions of the distribution of income, with this tendency reaching its apex in the “representative household” class of models. It is clear that households consuming less will have an immediate impact, as inventories will pile up and/or business sector profits will fall. This would trigger a retrenchment in production, which will then recirculate because of falling wage incomes as hours are cut. The notion of a “tendency to consume” is vague. Within stock-flow consistent (SFC) models, there are typically two propensities to consume: what percentage of current income is consumed, and (loosely speaking) what percentage of wealth is consumed. (Most people do not consume things like bearer bonds, rather, consumption is adjusted upward, and wealth will be adjusted via the household budget equation.) Depending on the model, we could have different propensities for different categories of income, or wealth. One typical division would be to differentiate consumption out of dividends versus wage income, which is one way to attempt to capture the different propensities to consume for different income/wealth quantiles. One problem is that we can only observe a single, aggregated level of consumption, and aggregated income statistics. (Information on income distributions typically arrives with a long lag, and is often only annual frequency.) If we allow time-varying propensities to consume (which is the premise here), it is clear that we may not be able to fit all the parameters to the available data. As such, we would need to be careful in how we compare model results to observed data. The above figure depicts the time series for household consumption and total production if the propensity to consume out of income drops from 0.6 to 0.55 in period 5 (and remains there). (The parameter value of 0.6 is the value used by Godley and Lavoie in model SIM in the textbook Monetary Economics.) The key point to note is that consumption immediately falls in period 5, while production falls in period 6. Since the production function is based on work hours and capital, work hours (not shown) would only fall in period 6. This is because the business sector sets work hours “in advance” of the time period, and is assumed to not be able to adjust work hours immediately in response to lower demand. This is not a property of all models; many SFC and DSGE models will have goods market clearing that forces work hours to adjust simultaneously. Post-Keynesians normally object to such a market clearing assumption, but it could be justified if the time period is sufficiently long. (The simplest SFC models in Monetary Economics feature such market clearing.) Since we need to have a relatively fine time step (most likely monthly) to capture the short-lived nature of most recessions, having businesses not being able to react to the current period demand seems plausible. The drop in consumption has a multiplier effect within the model. The figure above depicts the level of inventories. They immediately jump in period 5, which is a necessary consequence of the business sector reacting with a lag to changes in demand. Since sales were less than implicitly forecast, unsold goods pile up in inventory. 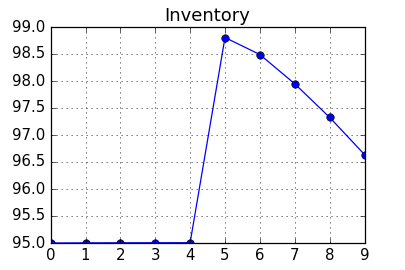 The inventory level then drops in subsequent periods. This is because businesses cut production to return the inventory/sales ratio to its target (which is 1 in the model). Cutting inventories is a form of disinvestment, and explains the drop in production in period 6. 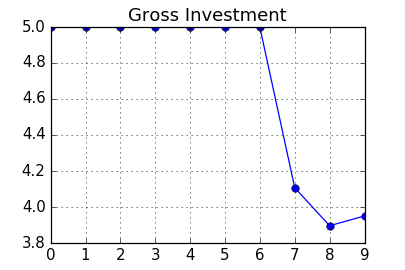 The dropping production lowers the target level of capital, and we see that fixed investment starts to fall in period 7. This is another way in which the change in the propensity to consume has a multiplier effect on total output. The key point to note is that the change in investment comes two time periods after the change in consumption. This tells us what to look for if we want to believe that consumption propensity changes cause recessions: consumption needs to fall ahead of the downturn in activity. The simple way to do this is to examine the appropriate time series, or one could try to appeal to various statistical tests. The author is unconvinced that this would be a useful line of research, at least based on models similar to the investment accelerator used to generate the previous simulation. The issue is that such an argument offers almost no useful information for recession forecasting if we believe that the propensity to consume is an exogenous parameter, as in the SFC model chosen. We have no reason to believe that we can forecast exogenous parameter value changes, so such an analysis just suggests that recessions just happen. We will only get some more useful information if we argue that the propensity to consume is a function of some measurable variables, such as the rate of interest. That angle of attack will be pursued in the chapter on neoclassical models. If we extended the model, we might be able to generate more useful information from a SFC model. One possible enhancement would be to break out durable goods (e.g., autos), as discussed earlier. The other would be to take into account financial disruptions to consumption; that will be discussed in the chapter on post-Keynesian models that incorporate financial market instability. Finally, we could look at the propensity to consume out of wealth. If we take the previous investment accelerator model, a change to the propensity to consume out of wealth would be nearly impossible to distinguish from the propensity to consume out of income. The reason for this is that the only household wealth in the model that appears in the consumption function is money holdings. (Equity ownership is implied by dividends, but the value of equity does not appear in the consumption function.) More complex SFC models include a range of financial assets. However, if we are interested in recession forecasting, the distinction between the propensities to consume out of wealth versus income only matters if there is a plunge in the value of wealth before the recession. This presumably is either the result of a disruption to the housing market, or the financial markets in general. As such, this possibility will be discussed in other contexts. That said, if one were to look at economic expansions, one could look at the so-called “wealth effect,” which was a subject of interest in the 1990s. For example, what was the effect of the bull market in stocks on the economy? However, this is not of too great an interest for the analysis of recessions. In summary, the housing market is the most obvious channel by which household sector behaviour on its own can trigger a recession. Otherwise, if one wants a theory that potentially generates useful predictions, one either moves to the topic of disruptions within the financial markets, or the possibility that the propensity to consume is a function of interest rates. Those topics will be discussed in later chapters. Brian, what about when large parts of the household sector suddenly decide they would rather not work (raise their reservation wage or whatever). I remember reading somewhere that this (and minimum wages) is what causes unemployment or something. Maybe you could model this phenomenon similar to the rise in energy costs. On the other hand, I kind of hope you don't take it that seriously.